On May 17-18, United Methodists from across the country and around the world will pull together for an event to help Change the World in both large and small ways. For the fifth year, local churches will take on service projects that improve the circumstances of others and spark public interest in volunteer activities. On Change the World Weekend, hundreds of United Methodist churches and thousands of church and community volunteers will deploy to parks, homeless shelters, food pantries, schools, health centers and more, to do what they can to help others. Since 2010, when the global service project began, countless volunteers from the U.S. and countries in Africa and the Philippines have completed more than 14,000 projects. Five years ago, the Rev. Mike Slaughter, United Methodist pastor and author, challenged church leaders to stop worrying about getting people into their church and start finding new ways to move people who are already there into God’s service. With that invitation, United Methodist Communications began an effort to get congregations to move outside the four walls of sanctuaries and Sunday school classrooms to help others on a common weekend. So began the annual Change the World event. Register your project now at umcom.org/changetheworld and don’t forget to send an email to vance@ctcumc.org and let the CTC Service Center know how and when you are planning on celebrating Change the World weekend. Churches who register their project(s) now can receive a free promotional kit while supplies last. The kit includes sermon starters, a lawn banner, a Rethink Church t-shirt and more. After registering for the event, you can submit new details or edit your event anytime by sending an email to changetheworld@umcom.org. 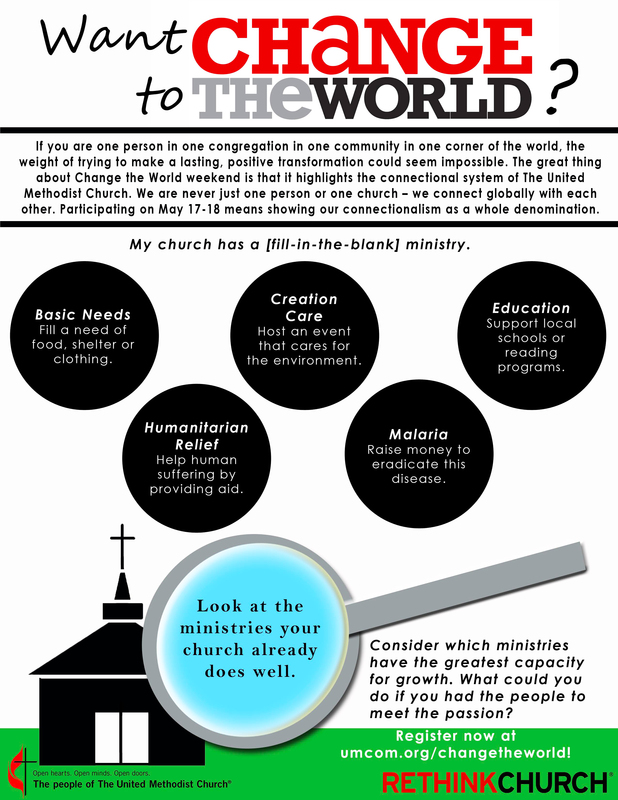 Change the World is part of United Methodist Communications’ initiative to Rethink Church, which uses outreach events to encourage churches to make a positive difference in the world beyond church doors and provide opportunities for others to serve as well.